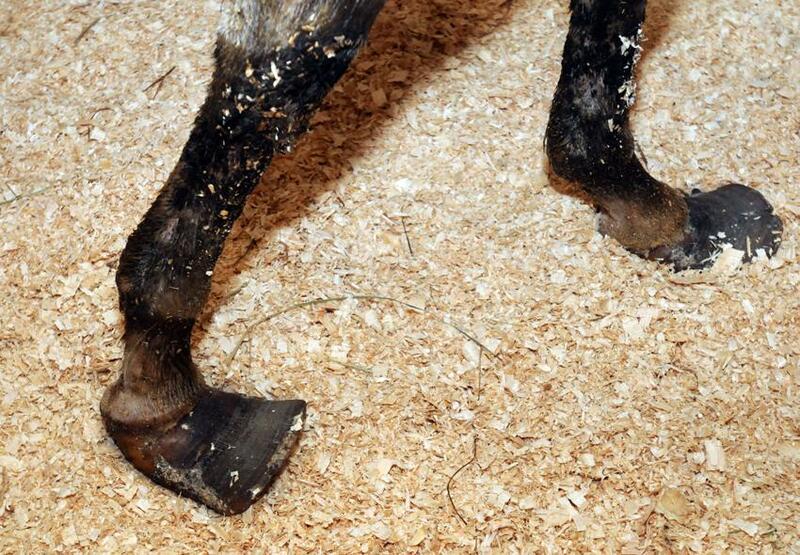 Cheyenne, a Paint horse that had been confined to a muddy stall for two years, shows some of the physical effects of the confinement: thoroughly overgrown hooves. Kathleen Schurman, farm animal rescuer in Bethany is fostering Cheyenne. Mara Lavitt/New Haven Register. BETHANY — A Paint horse was taken to a safe haven Thursday afternoon after officials learned the animal was allegedly left in isolation and found to be in two feet of manure and urine, officials said. Cheyenne, a 7 to 8 year-old mare was found nailed into a stall with caked in manure and urine. Animal control officials said the horse appeared to have been cooped up in the barn for the past two years. “She is significantly underweight and her hooves are extraordinarily overgrown,” said Woodbridge Animal Control Officer Karen Lombardi, who examined Cheyenne late Thursday. Local animal rescuer Kathleen Schurman who took in the mare said it was one of the worst cases she had ever seen. Previous Post Does horse racing have a better drug policy than the Olympics? This act of cruelty should be punished with the most severe penalties of the law I can not believe that a human being could do this to any thing ….I read all of these horrific acts towards animals and just cannot believe what I see and hear….I know there is a God and these monsters will get what is coming to them and I pray everyday they do! Where was the State and local inspectors who are supposed to inspect stables,farms, etc on a yearly basis? Where was the Board of Health ? That’s our government bureaucrats for you SUE. Receive pay for NO ACTION. Good Question Donna !!!!! This went on for two years, how awful for that beautiful paint !!!!!!! We need people to police the police now, dont we……………We can only pray Justice will be served !!!! I have no faith at all anymore in our government or our “justice” system All “justice” bends toward the perpetrator instead of the victim. OMG!!!! It took me 10 mins to compose myself to comment on this tragic ,horrific , despicable action, this really tests my faith in Mankind,,,,,,,,,,,,,,,,,,,whomever did this is a psychopath capable of the most horrific actions !!!! There is no justice severe enough for this person……………. Im sorry I would just like to beat the crap out of this completely insane cruel pitiful excuse for a Human……………………………..There is no explanation for this !!!!!!!! How does one begin to work on her hooves???? And rehab for her wasted muscles? How does a herd animal tolerate isolation for 2 years? I am sure the other horses will help her heal but her foster caretakers have a difficult job ahead! Honor – I’ve found, with almost any animal injured, abused or neglected that where there is life there is hope. It may sound cliche, but it is nonetheless true. However this darlin’ girl came to be in this situation, it did not diminish her joy nor kill her heart – her response to other horses is proof of that. And I believe she will recover, slowly and with patience. But even if her prognosis is poor or hopeless, she’s still a victor. She will be in the company of those who will love and care for her, bring her light and air, good food and companionship. No matter how it plays out, she will never be in the dark again. Another HEART BREAKING story. God bless all who are trying to help this precious girl. SHE NEEDS LOTS OF LOVE. And curse the person who did this to her. He/she doesn’t deserve to live. Lisa, i must tell you , that is beautifully written………………………with time and care she will be all she can be ………… The other horses she will be with will help her also…………………God Bless the rescue people who found her …………………. Lisa, what a beautiful comment. Thank you for sharing your healing thoughts here. Another stunning display of Lessons from the Horse !!!!! They are definitely here for all the reason imaginable !!!!!!! What they teach cannot be learned in any book ….God Bless everyone of the Horses ………………..
How did they nail the horse? Horrific notion. I like the name of your blog as I have a horse named Tuesday. When they say “nailed” her in, I believe they mean nailed the stall door shut; perhaps even boarded it up. However they did it, no one could get in; she couldn’t get out. When we started the Fund, we used to do email blasts to our followers once a week… on Tuesday. As we grew, and blogs started, we just kept the name because everyone knew it so well. We will be 10 years’ old February 2013. Dear God, that humans can be so horror filled! I am so glad you rescued this horse….whoever has her at this moment, please give her a hug from those of us who want to, but are not there to show her human love…..please do that for us! These are treacherous times for horses indeed because of malicious thinking and actions. Can you imagine? And her delight when she was free, seeing other horses after two years. That brought tears to my eyes. LOTS AND LOTS OF TEARS …..Would love to give her a BIG HUG. Nothing surprises me anymore… ALL ANIMALS ARE IN DANGER ON THIS PLANET. This is simply beyond my comprehension; how is it that it’s become so dangerous to be an equine on this planet?